Now that summer has slipped away, the tapestry of my yard has lost most of its color. Gone are the stunning blossoms of bee balm, coneflower and trumpet creeper. Despite dead-heading my zinnias to prolong the production of blooms, a scant few blossoms remain of the former kaleidoscope of color. The only plants contributing color to my backyard and offering food for nectar-feeders are butterfly bushes, lantana, Turk's cap and native morning glories. As for the morning glories, they volunteered in my gardens and along the roadside in front of my home. Which is fitting. 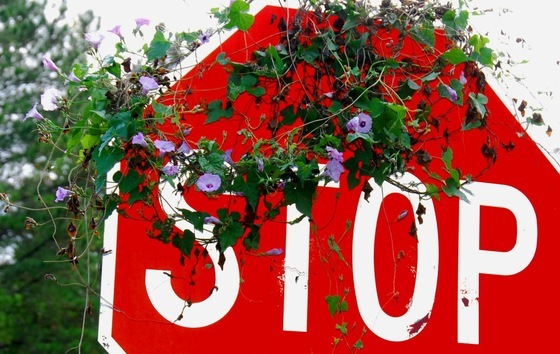 Although the morning glory is widely recognized wherever it grows, the plant lives under a cloud of confusion. Some people adore it, others revile it. Read Terry’s column on morning glories, their historical use and wildlife benefits. Terry W. Johnson is a former Nongame program manager with the Georgia DNR Wildlife Resources Division and executive director of TERN, the Nongame Conservation Section’s friends group. “Out my backdoor” library. Snake fungal disease has reared its ugly head again in Georgia. A brown watersnake marred with scabbing and other symptoms characteristic of the deadly disease was found in a Bulloch County swamp in August. This week, the Southeastern Cooperative Wildlife Disease Study confirmed the snake had Ophidiomyces ophiodiicola, the fungus associated with what most call SFD. Earlier this year, an eastern indigo snake in south-central Georgia also tested positive. That makes three free-ranging snakes in Georgia documented with SFD. The first was a mud snake caught at the same swamp near Statesboro as the watersnake in summer 2014 ("SFD confirmed," Aug. 25, 2014). A volunteer with The Orianne Society, a non-profit focused on conserving imperiled snakes, found both. While three’s not always a trend, DNR is encouraging herp enthusiasts statewide to report suspicious sightings. Snake fungal disease is a severe dermatitis that causes scabs, crusty scales, abnormal molting and other skin inflammation. First reported in a captive black rat snake from Sparta in 2006, SFD has been documented in at least eight species and a growing number of wild snakes in the eastern U.S. and Midwest. 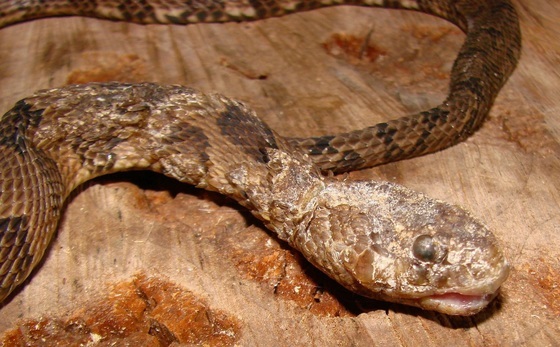 The disease is largely a mystery, in part because snakes are cryptic species. While SFD has been likened to white-nose syndrome, an emerging disease devastating bats in the U.S. and Canada, some question that comparison, noting that the scope of the impact and whether or not the disease is new are unknown. Yet none disagree that snakes face myriad threats, including habitat loss and fragmentation. Unfortunately, there’s also little love lost when another threat is documented. “They’re not a very popular group to begin with. Then you add a disease, and that doesn’t help,” McGuire said. 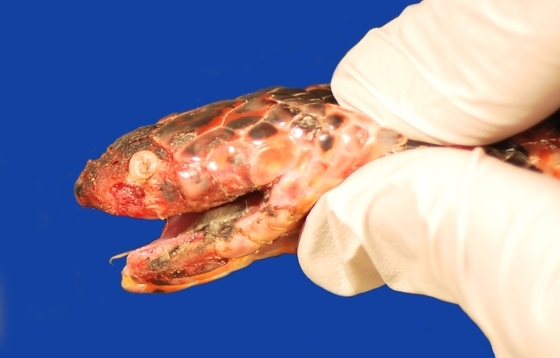 - Skin disease affecting snakes. Causes swelling, scabbing, abnormal molting and even open wounds. - Ophidiomyces ophiodiicola, a fungus found on snakes with SFD, is considered a causative agent. The fungus eats keratin, the substance of snake scales (and human fingernails). - Mortality rates are high. One researcher said no snakes documented as infected with SFD have survived. - If you see a snake with signs of SFD in the wild in Georgia, contact DNR's Dr. Jessica McGuire. DNR’s Nongame Conservation Section works to conserve and restore nongame species and habitats, including snakes. Snakes are part of our natural heritage, and are a vital to the realm of wildlife in our woods and waters. Also, of the 46 snake species native to Georgia, 40 are non-venomous and protected by state law. - Buy or renew an eagle or hummingbird license plate. It’s only $25 more than a standard plate and most of that fee goes, by law, to conserve nongame. - Give to the Georgia Nongame Wildlife Conservation Fund through the state income tax checkoff. - Contribute directly to the Wildlife Conservation Fund. A $2,500 reward has been announced by the U.S. Fish and Wildlife Service for information leading to an arrest in the shooting death of a bald eagle in northeast Georgia ("Help wanted," Sept. 29). A reward is also offered through the DNR Ranger Hotline. The juvenile eagle was found dead in a Banks County pasture near Baldwin Aug. 7. Contact (800) 241-4113, rangerhotline@dnr.state.ga.us or Fish and Wildlife Service Special Agent John Elofson, (404) 763-7959, ext. 222. Callers can remain anonymous. Suwannee moccasinshell mussels should be protected as a threatened species under the Endangered Species Act, according to the U.S. Fish and Wildlife Service. 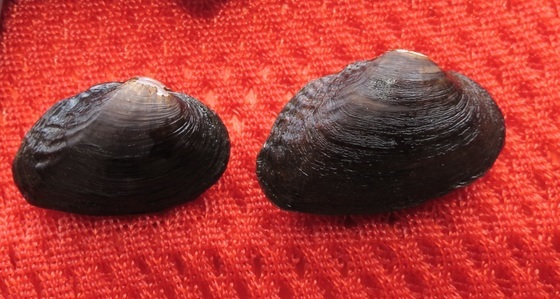 Endemic to the Suwannee River basin in Florida and south Georgia, this mussel is currently known to live only in the Suwannee main channel and the lower Santa Fe River in Florida. A Withlacoochee River survey recently by Nongame Conservation Section and Florida and federal wildlife agency staff turned up no Suwannee moccasinshells. Historical records show the species has been documented at four sites in the Georgia portion of the Suwannee River Basin, including the Withlacoochee near Valdosta. The black pinesnake, which can grow up to 6 feet long and is now found only in Mississippi and Alabama, will be federally listed as threatened. The Fish and Wildlife Service also announced exemptions aimed at helping the snake recover, provide for activities such as logging and inform landowners. As American oystercatchers flock to Georgia from Atlantic states farther north, DNR biologists are keeping track. 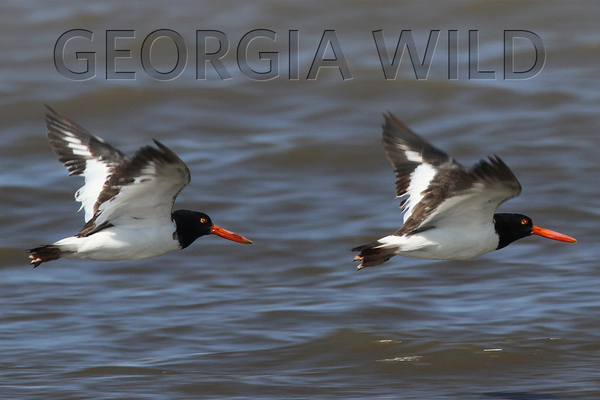 More than 200 oystercatchers, about 50 of them banded, are using the mouth of the Altamaha River. CoastFest 2015 was crowded, which is the usual state of this event held annually in Brunswick since 1995. More than 7,500 enjoyed the educational and fun displays at DNR Coastal Regional Headquarters on Saturday. 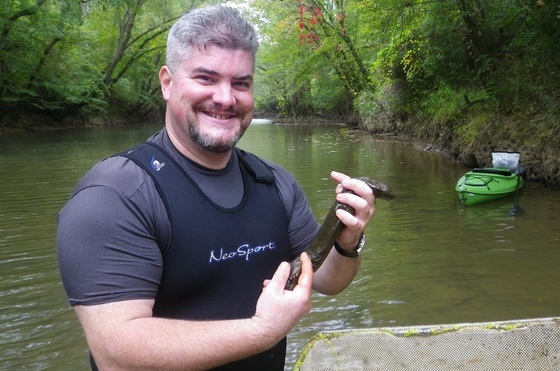 DNR biologist Thomas Floyd helped find a hellbender in another neighboring state Oct. 1. The latest catch (see “Hot summer for snot otters,” Sept. 29, for news of an Alabama 'bender) came during a Mississippi Museum of Natural Sciences survey of the species' historical Tennessee River drainage in northeastern Mississippi. Anglers had reported seeing hellbenders, and a sighting was verified last year, but this hellbender is the first documented from a survey in the state since 1996. Bear sightings are increasing as the big mammals fatten up for winter, a stage called hyperphagia. DNR state bear biologist Adam Hammond said activity is up, particularly in north Georgia where the mast crop – acorns, fruits and berries – was lighter this year. Black bear facts. Fall also means deer breeding season across Georgia, which is when drivers are more likely to hit deer. A UGA study including DNR analyzed breeding data and more than 45,800 deer-vehicle collisions from 2005-2012 to create a county-by-county map of peak dates for the rutting, or breeding, season. Banks Lake, centerpiece of the popular Banks Lake National Wildlife Refuge near Lakeland, will be drawn down this winter to help control submerged vegetation. A water structure control between Banks and Irma lakes will also be replaced. A community meeting on the drawdown is set for Oct. 29. Campfire, stories, s’mores: What more do you want? Enjoy a free night of fun during a Family Campfire Oct. 10 at Charlie Elliott Wildlife Center near Mansfield. Names in the news: State Sen. Ross Tolleson (R-Perry) will retire from the Legislature because of health issues. Tolleson, chair of the Natural Resources and the Environment Committee and vice-chair of the Rules Committee, has been diagnosed with early onset of Alzheimer's. Maj. Stephen Adams of the DNR Law Enforcement Division has graduated from the National Conservation Law Enforcement Leadership Academy. Adams is a 17-year veteran with DNR. Bird banding at Panola Mountain State Park: 6:50 a.m. Oct. 24; 6:50 a.m. Oct. 31; 6 a.m. Nov. 14, 21; 6:30 a.m. Dec. 5, 19. Charlie Muise, Georgia Important Bird Areas coordinator. 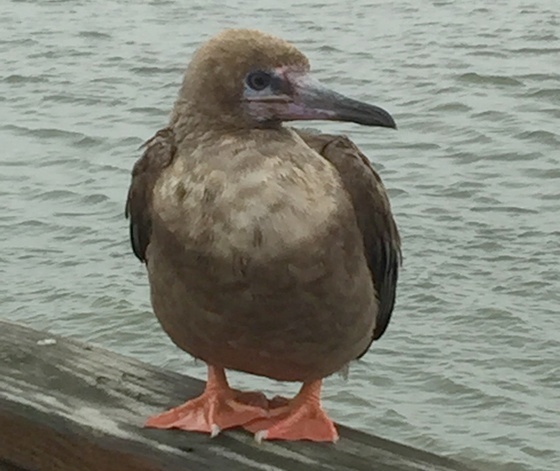 Tim Keyes, Nongame Conservation Section ornithologist on the coast, spotted this red-footed booby on the St. Simons Island pier Tuesday. The sighting of the pan-tropical seabird in Georgia, possibly the first on record, drew a flock of birders. Red-footed boobies seldom come to shore except to nest, and are rarely seen farther north than Florida (primarily on the Dry Tortugas). They nest on island colonies from Belize through the Cayman Islands and Puerto Rico through the Lesser Antilles. The species is related to blue-footed, brown and masked boobies.